A leading human rights group has said the US and UK are wrong to use the toppling of a brutal regime in Baghdad to justify going to war against Iraq. The group, Human Rights Watch asked why George Bush and Tony Blair did not try remove Saddam Hussein much earlier. Its report comes as the former US chief weapons inspector questioned the CIA's assessment of the threat from Iraq. Tony Blair is also under pressure, awaiting the findings of an inquiry into the death of a UK weapons expert. 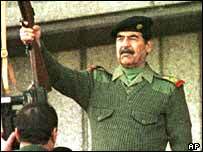 Mr Blair and Mr Bush have come under increasing pressure from critics of the war over their failure to produce convincing evidence that Saddam Hussein possessed banned weapons of mass destruction. Human Rights Watch said Mr Bush and Mr Blair should not try to justify the war retrospectively as an effort to save human life. "Only mass slaughter might permit the deliberate taking of life in using military force for humanitarian purposes," it said. "Brutal as Saddam Hussein's reign had been, the scope of the Iraq Government's killing in March 2003, was not of the exceptional and dire magnitude that would justify humanitarian intervention. "The Bush administration cannot justify the war in Iraq as a humanitarian intervention, and neither can Tony Blair." In a US radio interview on Monday, the former chief US weapons inspector David Kay cast further doubt on the existence in Iraq of banned weapons of mass destruction. Mr Kay said he thought the Central Intelligence Agency (CIA) owed Mr Bush an explanation for warnings about the threat Iraq posed. The issue is also stalking Mr Blair, whose political future depends on the findings of a report to be released on Wednesday which will examine claims he exaggerated the threat from Iraq.